Wicked Hunting Lights™ is excited to announce the addition of the all new W403IC Hunting Light with Intensity Control and Scan & Kill® Technology. Successfully target hogs, coyotes, fox, bobcat, raccoon and varmints at night with the Wicked Hunting Lights™ W403IC Hog & Predator Hunting Night Hunting Light. 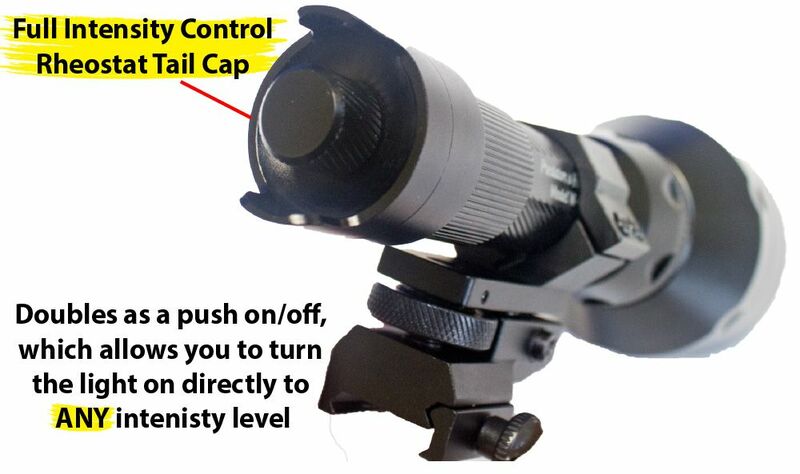 All New for 2015, The W403's Full Intensity Control Tail Cap out classes the competition with true full-range control of light intensity coupled with selectable "ON/OFF" to any light intensity level the user desires - An industry first-in-class ability! Both lights are "ON". In the field, at night the light on the left will "halo" and illuminate the shooter, weapon barrel, equipment, and hunting partners to the left and right of him. The W403IC on the right side minimizes the potential for side spill of light or "haloing" personal or equipment by utilizing a properly designed bezel with a built in halo shield. An exciting and relatively new development in night hunting lights is the ability to zoom focus the beam. The advantage of the zoom focus beam is the ability to defuse the light for your initial scanning, once you see eyes you can quickly adjust the intensity up or bring it back down based on the target animals reaction (if any) to the light. Ideal technique would involve defusing the light down during initial scanning until eyes are spotted, then gradually bringing up the intensity to full power, positively identifying the animal, and if hunting with a partner they engage the target animal with a dedicated weapon mounted light, or if they not equipped, then illuminating the target animal with the W403IC scan light for the shot. The Wicked Hunting Light W403IC utilizes a robust deep rotation grove for smooth transitions from flood to zoom. After careful consideration and extended field testing in very cold icy environments (Alaska, New York, Minnesota) the fine treaded style design was eliminated because of durability issues. Cold temperatures, frozen moisture and grease do not mix well with fine aluminum threads. Multiple fine threads also increase the effort, amount of hand twists, and time to rotate the bezel from flood to zoom or back. The W403IC is the only hunting light in its class featuring a built in halo shield which minimizes inadvertent Illumination of personnel or equipment to the left and right of the operator. Includes the all new Generation 3 coiled cord "ON/OFF" tail cap with enhanced and upgraded wiring, push in and rotate to secure coiled cord for enhanced durability. 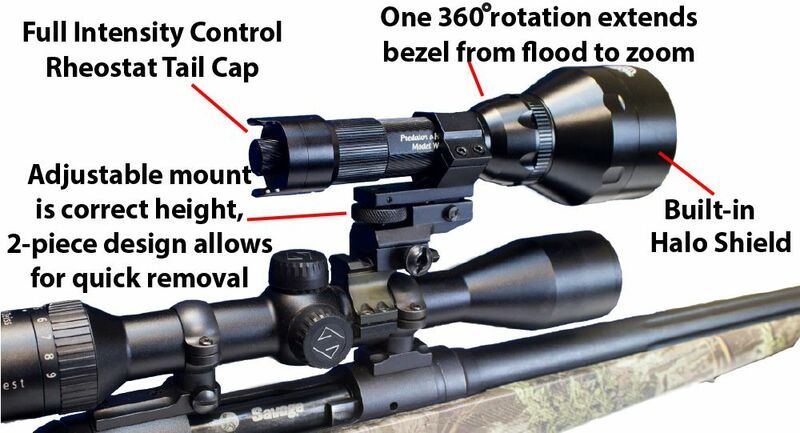 One of the most important area to consider when choosing a scope mounted light is the mechanism which the light attaches to the scope mount and its ability to adjust the fully focused (zoomed in light) beam to the center of the cross hairs. FAIL Wrong height above picatinny mount platform which prevents proper adjustment and alignment of light beam with. scope cross hairs. FAIL Poorly designed elevation adjustment gearing with too little travel. FAIL Weak internal adjustment tension spring. FAIL Light mount diameter not correct. Difficult to start and secure the four hex head screws when light is installed often resulting in stripped threads. PASS Correct height above picatinny mount platform which provides for proper adjustment and alignment of light beam with scope cross hairs. PASS Elevation adjustment gearing with full little travel to adjust light beam to cross hairs. PASS 300 percent stronger internal adjustment tension springs. PASS Correct light mount diameter. Easy to start, secure, or remove the four hex head screws. 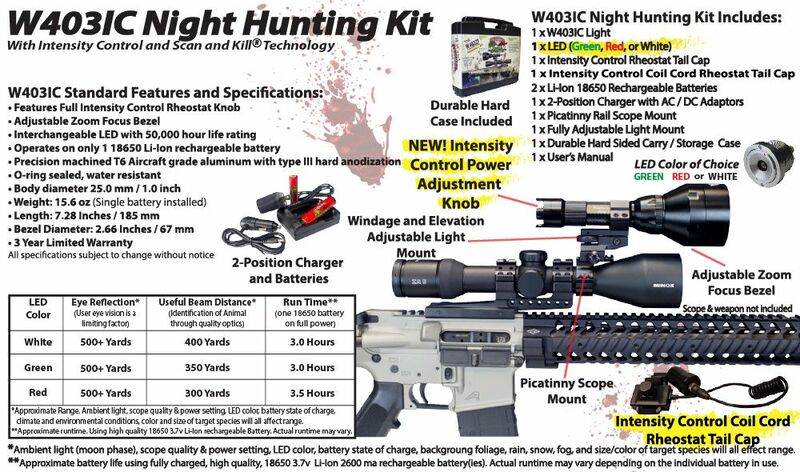 Battery runtime note: Each Wicked Hunting Lights kit includes Li-Ion 18650 Protected Circuit (PC) batteries. Because of battery manufacturer variances, particularly in the under voltage settings of batteries and exaggerated milli-amp hour rating (mAh), light operation times can vary significantly. For example one brand of battery could have a 3.2VDC under-voltage PC setting and another could be 2.5VDC, which will result in a longer light runtime for the latter. Because of these variables the light runtime will vary depending on battery, milli-amp hour rating (mAh), battery state of charge, and PC installed in battery. Your results may vary.